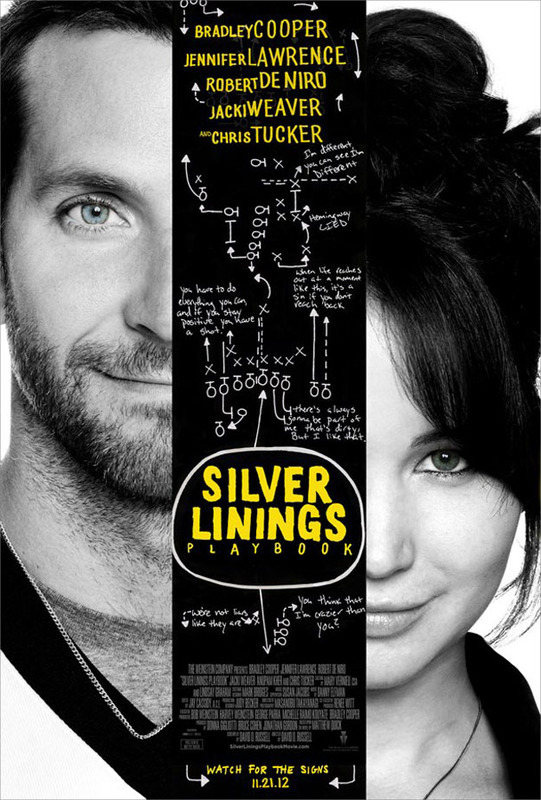 Silver Linings Playbook is a romantic comedy by definition, but it is presented in a way that most in the genre are not. Bradley Cooper (in a surprisingly subdued performance) stars as Pat Solitano, a former high school teacher diagnosed with bipolar disorder. After an eight month stay in a mental hospital, Pat is released into the care of his parents, Pat Sr. (Robert De Niro) and Dolores (Jacki Weaver). The only thing on Pat’s mind is a desire to reconcile his failed marriage with his ex-wife, Nikki (Brea Bee), who now has a restraining order against him due to a previous violent outburst. While having dinner at a friend’s house, Pat meets Tiffany (Jennifer Lawrence), a young woman who is going through a very rough patch as well (her husband just passed away in Iraq). They begin a peculiar relationship in which Pat attempts to communicate to Nikki through Tiffany. She agrees to help him if he will enter a dance competition with her, something she never got to do with her late husband. This shaky agreement works as a sort of therapy for both of them, as both seem to come to grips with their respective mental illnesses at the same time. Familiar conventions of the romantic comedy genre eventually arise, particularly in the film’s final act, but the journey to this point is anything but conventional. Director David O. Russell’s inclusion of mental illness as an integral part of the storyline is a bit of a ballsy move, but he manages to portray both characters and their traits in a sensitive light. The chemistry between Cooper and Lawrence is electric, with both turning in what may very well be the best performances of their careers. It’s shocking that Lawrence is just 22 years old — she has the presence of a seasoned veteran in this. Perhaps most exciting is seeing Robert De Niro return to relevance with one of his greatest roles in years. His take as the OCD diehard Eagles fan shows glimpses of just how Pat Jr. began struggling with his own mental issues. Chris Tucker even has a small role that is worthy of a mention, largely because he is not as obnoxious as usual. Silver Linings Playbook deserves credit for bringing something new to a tired genre, and even though it falls back on familiar tropes, it’s still a strong effort with a likable set of characters. Definitely on my movie watching and awards list. Thanks, Eric. You got it, Michael. This one is well worth seeing. Good review Eric. I had a great time with this movie and almost loved it from start-to-finish. Everybody’s just great here and it’s really nice to see De Niro acting in material that deserves his skill and talent. Hope he decides to take more and more roles like this. I just hope. Yeah, I hear you about De Niro. The man hasn’t done a whole lot to impress lately, but he was fantastic in this. We’ll have to see if he can build off this momentum. I’ve been meaning to see this one but I’ve never been overly keen on David O. Russell’s work. I guess I’ll have to check it out. Nice review. Hey ckck, thanks for the comment! I’d say this one is worth a shot — it’s an interesting spin on the romantic comedy genre, and Jennifer Lawrence & Bradley Cooper make for a surprisingly strong duo. I missed this at the cinema but it’s definitely on my to-watch list. Pleasantly surprised by all the reviews it’s getting, the trailer didn’t really do anything for me. Nice review Eric. Thanks man. Yeah, the trailer doesn’t really do this justice at all. This isn’t a typical romcom as the promos are suggesting. Cheers, T, hope you like it! Hmm.. I thought I did, but I can’t find one anywhere. Not sure if I will get the chance to do a full review, but I will say that Hugo was one of my favorite movies from last year. It’s especially great if you have an interest in classic cinema, as there is a nice little tribute to the early days of film in it. Very good all-around family flick, too. Yes, i had thought you had one a review on it as well. Could you do a Dark Knight Rises review soon? It won’t make my top 10 of the year, still it was an ok watch, which is worth a look. Should do pretty well during awards season, I could see Cooper or Lawrence winning for performances, particularly since it’s quite a week year for performances, especially females. Maybe the film will grow on me, time will tell. I think Lawrence has a strong chance at the Oscar this year, no doubt. Not sure about Cooper, but he could get a nomination. I think this film was a little over-hyped, but I enjoyed it quite a bit. It has a solid chance to make my top ten this year. Glad you at least enjoyed it somewhat, man.